If you’re not familiar with its predecessors—the last major version of which, Delicious Library 2, was launched in 2008—the app lets users organize and track their collections of books, movies, other media, and even tools. The easiest way to add an item to your libary is by holding its barcode up to your computer’s webcam for scanning, which enters pertinent information of the item, including a photo, to the “shelves” of your virtual library. 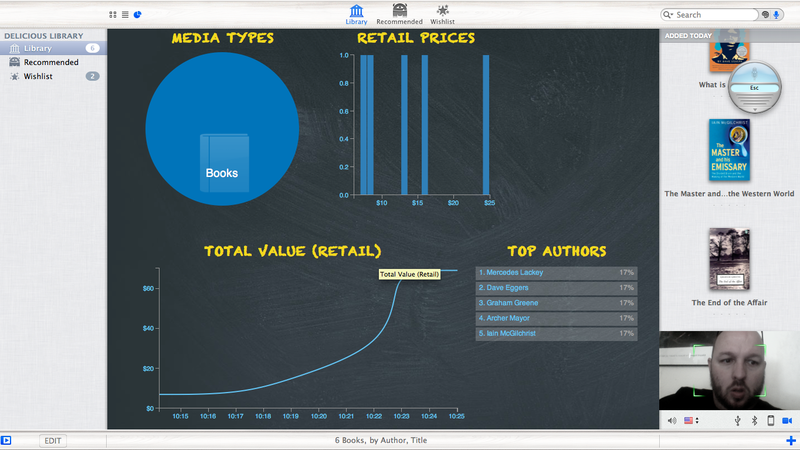 Users can see an analysis of their collection and its value. That scanning can be hit-or-miss: Delicious Library 3 misidentified four of the first 10 books I scanned. You can re-scan the barcode; sometimes that will correct the problem and sometimes it won’t. (My wife’s copy of Monstrous Regiment by Terry Pratchett was finally correctly identified on the third try.) Otherwise, you can delete the entry and/or hand-enter the information—a painful slowdown when you’re getting used to the zippity-quick scanning process. Tempted as I was to chalk the misidentifications up to the relative obscurity of my wife’s collection, the books of mine that Delicious Library successfully scanned seemed to be equally obscure. While Delicious Library 2 could be paired with a Bluetooth-enabled barcode scanner—like the ones you see at retail stores—the new edition offers integration with iOS devices: The free mobile app, Delicious Monster, pairs your iPhone or iPad with your computer over a Wi-Fi network. The app doesn’t retain any records—you can’t look at your library on your phone—but it can scan barcodes and transmit that info to your computer. That’s a particularly handy feature if you’re working from a Mac desktop, and don’t want to lug piles of books to be scanned using the webcam. A warning, though: Delicious Monster is built to be used only with iOS 6.1 or later. You can find books by the colors on their covers. Once scanned, Delicious Library 3 offers several features. 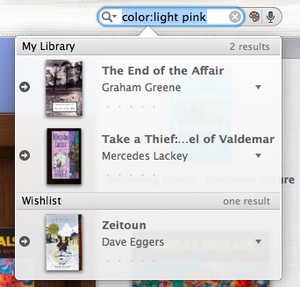 First, it generates a list of other, “recommended” items you might enjoy, based on what you already own. You can save these items to a wishlist, or click on it and be whisked to Amazon.com to make the purchase straightaway. The app also makes your collection searchable in several ways: By keyword, of course, but also by a spoken search (though this feature also seems hit-or-miss). You can also simply choose a color, and the items you own that contain that color will pop into view. You may not be able to judge a book by its cover, but it makes it so much easier to find. A final feature: Delicious Library 3 can analyze your collection, give you a breakdown of the number and types of items in it, and give you an overview of its relative value, compared to current market prices for the items within. If you’re selling your books, for example, this feature acts as a sort of “Blue Book” of value that helps you set the price just right. What’s the main difference between Delicious Library 3 and its predecessor? 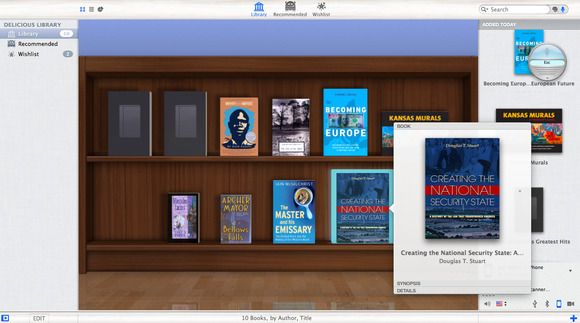 There’s the iOS integration, the chart features, and the redesigned interface—but there’s also the matter of the operating system: Delicious Library 3 works on Mountain Lion only; Delicious Library 2 is available only for Lion and its predecessors. A free, demo version that lets you scan up to 25 items is available at the Delicious Monster site. The full version is available as a $25 purchase from within the demo, or from the Mac App Store. Delicious Library 3 is ideal for cataloging physical media, but it still has work to do in handling digital media.